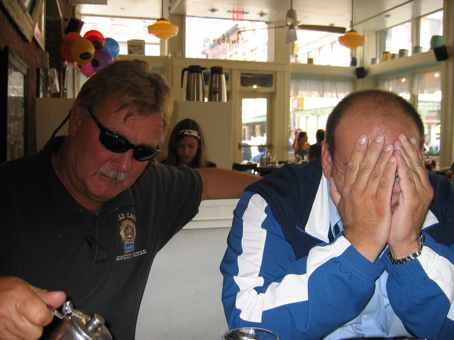 I had breakfast with a couple of the detectives from the Cold Case Squad, Tommy Wray and Steve Kaplan. Steve wouldn’t let me take his picture, the BIG BABY. Tommy Wray is retiring this week. Breaks my heart. And his. He doesn’t really want to retire. Hopefully I’ll get to write about why. The really sad part is he’s retiring with the Christine Diefenbach case unsolved (this was one of the cold cases I wrote about — Christine was a 14-year-old kid who was murdered in Queens almost 20 years ago now). Talk about heartbreak.